I bought it yesterday (Friday) with my hubby at Low Yatt. At first, i thought of going to the PC Fair which is being held at KLConvention Centre. But, a dear friend of mine told me that she bought a pc (or a notebook) at a PC Fair and when she wanted to send in her gadget for repair, the shop wasn't even exist! So, that's why i went to Low Yatt. I bought this for RM3 488. Quite pricey, though. 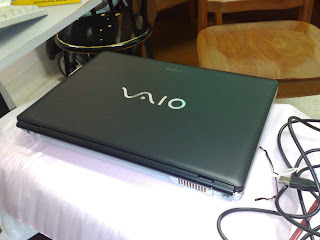 The original intention is to get Vaio with Blue skin, but that one cost around RM4 488. So, i have to settle for this one..
Ok, enough about me. What about Alia, huh? 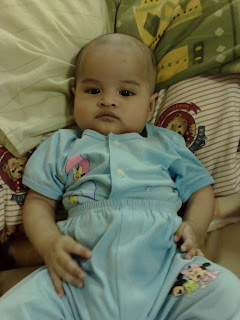 Last Thursday, we went for her 4 month check up.. She gain a little, just 5.6 kg. Luckily, at this check up, she didn't get any shots! :) phew! Oh ya, the nurses there ask me not to put ALia's mittens anymore, because around 2.5 month to 5 months, she should be able to grab / hold things. And she is nowhere near that target! hehehe..
Sekarang ini alia tgh belajar pegang2.. alhamdulillah.. ye, stokin masih pakai lagi..
Atuk and Wan is BACK!!! !